TGIF friends! This week has been busy, busy, busy and this mama needs a relaxing weekend for sure! We’ve got a little boy home from school today for teacher conferences, so let’s get this post published so we can be off to play! Today, I’m recapping some of my favorite Fall looks that will transition easily to winter that’s approaching soon. I heard someone on the Today show already counting down the days until Black Friday!! #canyoubelieve?!?! 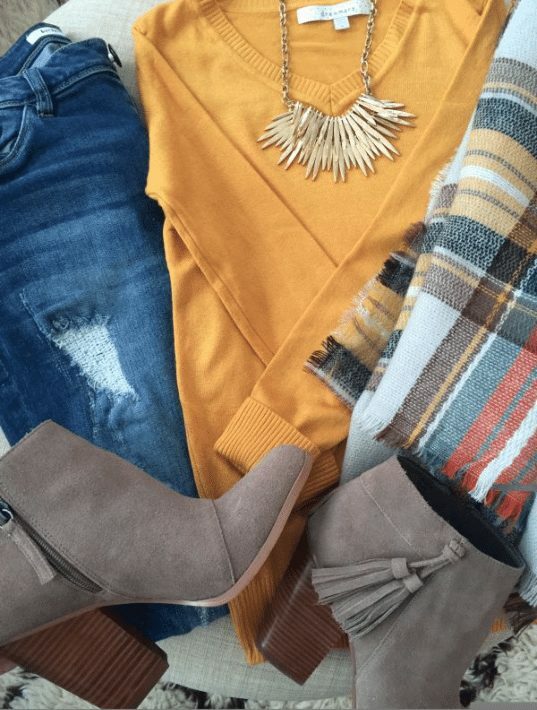 Tassel booties, lightweight sweaters and, when the weather cooperates, a colorful scarf are in heavy rotation around here! We had some dreamy cool weather here lately, and we’re supposed to have more this weekend! 🙂 You might remember I bought these Dreamers V-Neck Sweater and the U-neck style, because I wanted some thin, solid colored sweaters to dress up with colorful scarves and shoes. I love the quality and price (under $20! ), but size up because they run small. 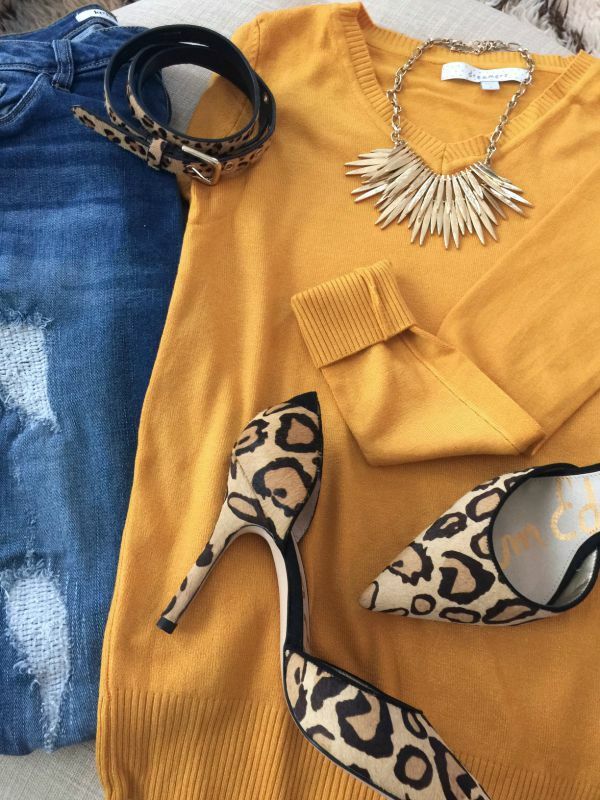 Or change up the look with a leopard skinny belt and fierce leopard heels. Another lightweight sweater I’m digging is the Trouve Zip Neck Sweater (40% off). The zip front is a cool, different detail and it also has slits on the side. 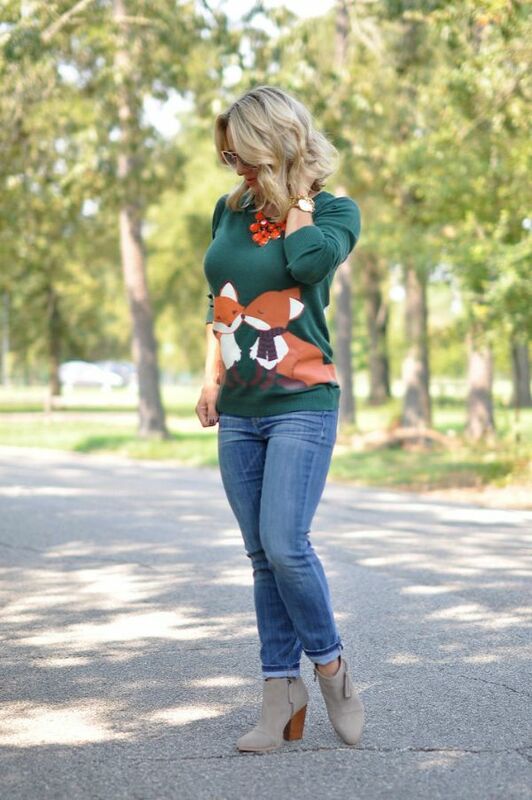 This adorable kissing fox “Smooch Mooch” sweater is a great forest green and I like to play up the orange in the foxes with an orange statement necklace. 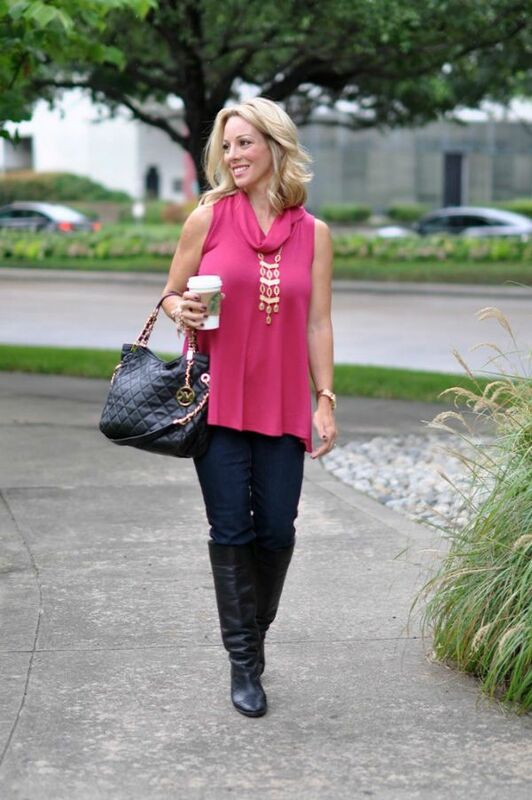 I loved the comfort and style of this Madison & Berkeley Cowl Neck Sleeveless Top so much that I bought it in the navy too. It’s really soft and the bottom is loose and comfy. Will be easy to throw a jacket on with it when it gets cooler. 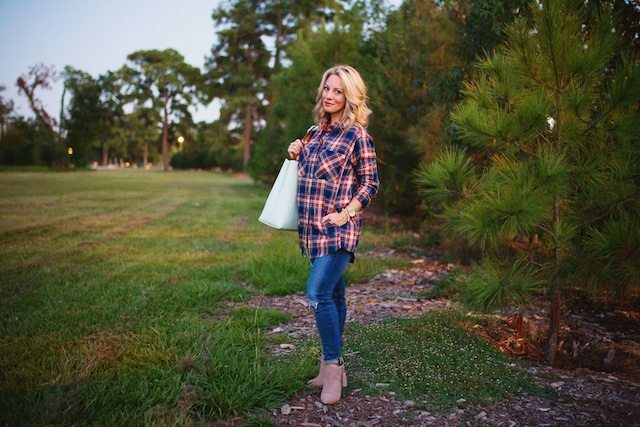 If you like to have something to cover your shoulders or keep at the office or in the car for when you get cold, try this plaid poncho. The black and white will compliment lots of outfits and it’s light enough so you’re not sweating underneath. Of course plaid is also popular in a button down this time of year. Now all we need is a pumpkin patch! ANN TAYLOR: Sweaters priced at $49.50. BANANA REPULBIC: Up to 40% off & 40% off sale items. GAP: 30% off your purchase (including sale items). Use code EXTRA. GIGI NY: 10% off with email sign up. LOFT: 40% off sweaters and tops; Extra 40% off sale styles. OLD NAVY: 30% off all outerwear & 20% off the rest of your order. Use code THREEBIE. 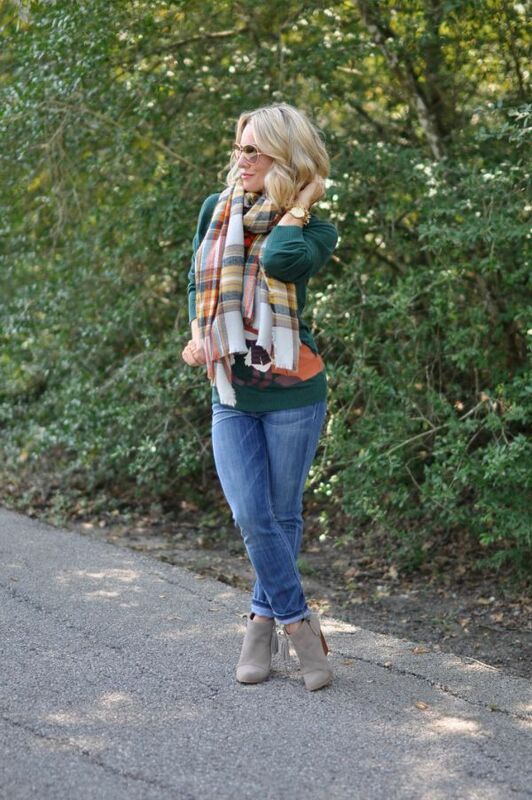 Those ankle booties are SO cute! 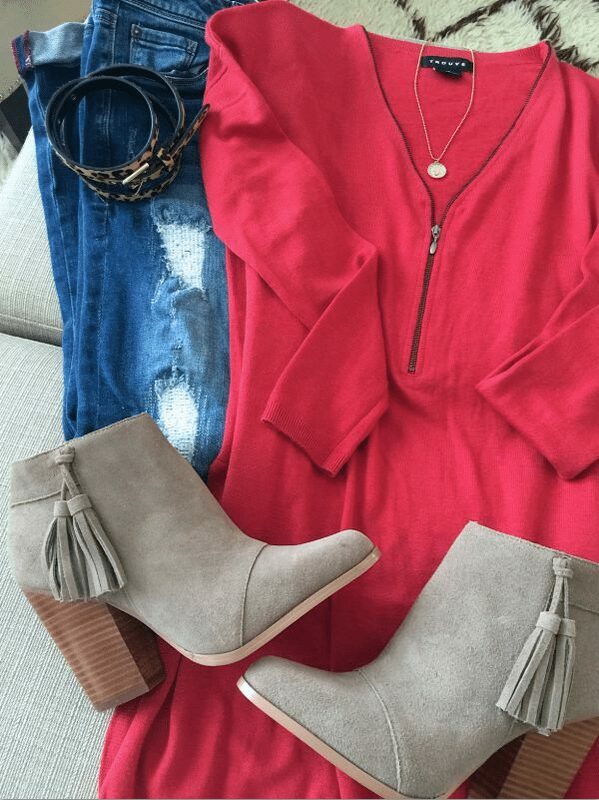 Those tassel booties are SO cute! 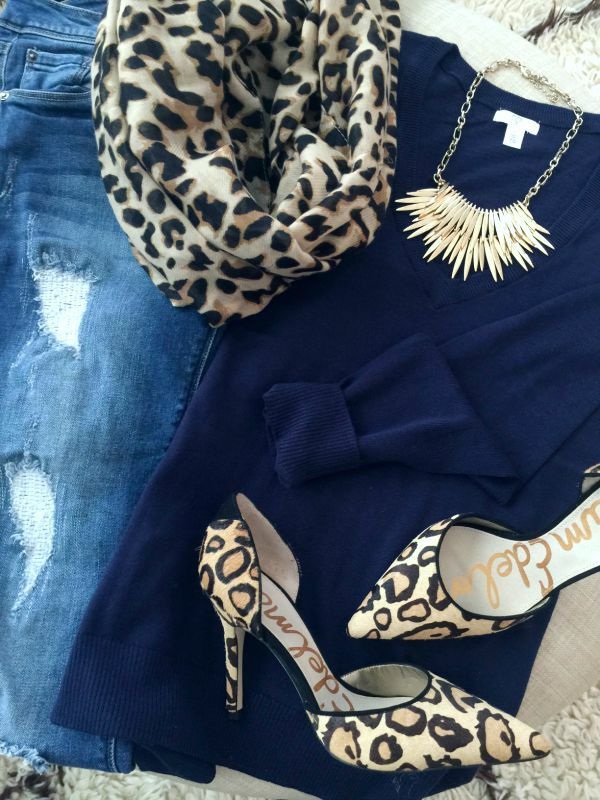 Love those sweaters with the leopard! Can't wait for sweater weather. It's still too warm in Austin. Leopard gets me every time! I love the outfits! I want to order the initial necklace but I don't know do you buy your first or last initial? Either! I got a J for my son's name! Also if i don't like a lot leopard print for clothes your choiche for details (shoes, scarfs, rtc) is very interesting!! !